Unlike NASA's Blue Marble — which is a composite made from many different photographs — this is a portrait of Earth taken in one single shot. 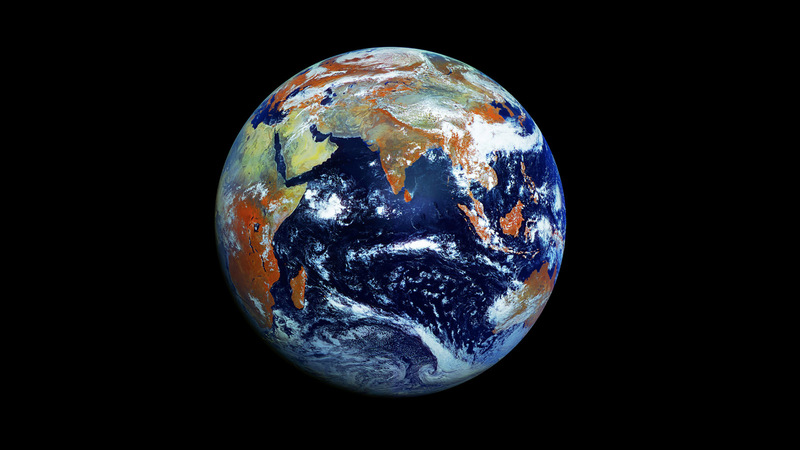 It's the highest resolution image of our home planet at 121 megapixels. That's a resolution of 100km per pixel. This image was not taken by NASA or the European Space Agency. It was taken by Russia's latest weather satellite, the Electro-L.
Elektro-L is now orbiting Earth on a geostationary orbit 36,000 kilometres above the equator, sending images every 30 minutes using a 2.56 to 16.36 Mbits per second connection with ground control. The images — and the video of the northern hemisphere — combines four light wavelengths, three visible and one infrared. The orange you are seeing here is the vegetation. Elektro-L is a Russian Satellite similar to GOES (the satellites that provide the cloud image loops shown on the news every night). The images posted by Gizmodo are a combination of visible and near-infrared wavelengths, so they show the Earth in a way not visible to human eyes (vegetation looks red, for example). They're not any better or worse than NASA images, but they show different things. The Elektro-L is similar to their GOES satellites. "It's a geostationary weather satellite orbiting above the equator at ~54˚ East," says Robert. "The US has two similar operational geostationary satellites over the east and west coasts, EUMETSAT has one over Europe and one over the Indian Ocean, Japan has one over the far western Pacific." The difference between them is that Elektro-L uses three bands in reflected light-red and two near infrared bands-while NASA's GOES doesn't have the near-infrared. The 3 reflected sunlight bands can simulate a conventional red-green-blue colour picture. The near infrared channel is a vegetation indicator, since plants reflect near-ir as well as green. You can learn more about the basic characteristics of Elektro-L's ten-channel imager, the Multichannel Scanning Unit (MSU), here.